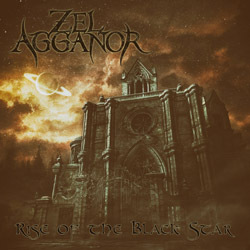 Epic symphonic black metal band Zel Agganor from York, England released its debut EP “Rise of the Black Star” on December 30, 2017. Zel Agganor is the personal project of Henry Mahy, conceived in 2016 with the intention to reveal and explore a darkly mystical realm and tell its tales through the medium of symphonic black metal. Each track is a chapter of the story, heavily featuring narrated vocals alongside a more traditional growling style. “Rise of the Black Star” is the first, five-chapter installment of a symphonic metal saga of tales of a darkly mystical fantasy realm. The lyrics reveal the story of an obscure religious cult who has uncovered the secrets of a long-forgotten legacy that once brought total devastation to the world, and the beginnings of a malevolent campaign to bring about a new age of darkness and chaos.